Countless books and articles have been written on the topic of "how to play golf.” One book rises above the rest: Ben Hogan's Five Lessons The Modern Fundamentals of Golf. It is quite simply one of the best books on learning the fundamentals of playing great golf! Originally published in 1957, with several re-issues, it is a classic! The main reason this book is so remarkable is the author himself, Ben Hogan. He became a professional golfer in 1930 and by the time he retired in 1971, had 68 professional wins, with 9 Major Championships. He was the PGA Tour leading money winner in 1940, 1941, 1942, 1946, and 1948, and voted PGA Player of the Year in 1948, 1950, 1951, and 1953. He also won the Vardon Trophy in 1940, 1941, and 1948. Hogan was also The Associated Press Male Athlete of the year in 1953 and was inducted into The World Golf Hall of Fame in 1974. With an impressive record like that, it's easy to understand why Ben Hogan is considered to be one of the greatest golfers of all time! Another reason the book is superior to any other is the co-author, Herbert Warren Wind, who himself was an avid golfer and professional golf writer. Wind coined the phrase "Amen Corner" to describe the second shot at the 11th, all of the 12th, and the tee shot on the 13th hole at the Augusta National Golf Club, the site of the annual Masters Tournament. On the subject of Ben Hogan, Wind wrote "Although golf makes a student out of anyone who touches it, it is really quite doubtful if any player throughout golf's long history has ever brought to his studies the basic tenacity, the acute and brilliantly ordered method, and the hours of relentless exploration that have marked Ben Hogan's efforts to understand the game as clearly as possible in order to be able to play as well as possible." Simply reading Ben Hogan's Five Lessons The Modern Fundamentals of Golf will not make you a better golfer! You must put the time and effort into learning the correct swing plane. In short, you must practice, practice, and practice! What is the "secret" to playing great golf? In the Foreword to Hogan's book, Sidney L. James, the founding editor of Sports Illustrated, wrote "...If ever a man has truly learned the secret of good, of great golf, it is Ben Hogan." Both the professional and amateur golfer are each searching for the same thing, to master the golf swing and the movements that will result in a repeating swing. Ben Hogan devoted the bulk of his waking hours for a quarter of a century in the pursuit of such a swing and used the same fundamental swing for every shot. Ben Hogan's Five Lessons The Modern Fundamentals of Golf outlines step by step, everything you need to know to learn the fundamentals of the movements for a repeating swing. This book contains no gimmicks, but is instead full of practical and useful information to help you improve your golf game. It teaches the correct grip, stance and posture, and describes the first part of the swing, the second part of the swing, and then gives a summary and review. Modern Fundamentals is easy to understand and there are several lifelike drawings to visually aid you. This book answers the question that so many amateurs have; "How do top notch players get the most distance from their clubs?" You will understand how these players can turn a 5 iron into a 4 iron, and why the average golfer does the opposite, making a 7 iron out of their 5 iron. You will learn every facet to playing a great game of golf. My husband has been an avid golfer for as long as I've known him. Soon after we were married, he encouraged me to take-up the game. I did, and immediately discovered that it was much harder than it looked. In my quest to become a better player, I read all the golf magazines and several books on the subject. I also tried so many of the items advertised to make you a "better golfer." I played decent, but it wasn't until I read Ben Hogan's Five Lessons The Modern Fundamentals of Golf that I began to understand the true fundamentals of a consistent golf swing. The knowledge I gained was far superior to anything I had ever read or tried! After reading this book, I changed everything about my swing and it worked! During the 2011 AT&T Pebble Beach National Pro-Am, professional surfer and 10 time world champion, and a 4 handicap, Kelly Slater was interviewed and disclosed that he’d read Ben Hogan’s Modern Fundamentals book. Not only did Slater apply it to his golf game, but he began thinking about the technical side of surfing and applied several of Hogan’s fundamentals to his surf routine! Ben Hogan once said "I have always thought of golf as the best of all games, the most interesting, the most demanding, the most rewarding. I cannot begin to express the gratification I have always felt in being a part of a game with such a wonderful flavor and spirit..."
In short, this is one of the best books you will find on the subject of how to play golf! 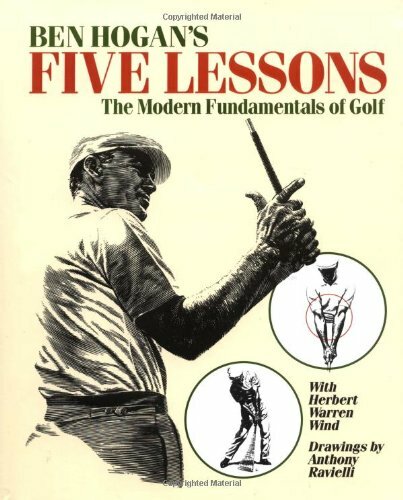 good review all golfers would love to know about this book Ben Hogan's by Herbert Warren Wind, Five lessons, the modern fundamental of golf, always wish I had learned to play. Thanks Sharon ~ It's never too late to learn! This well written review will be helpful to anyone interested in golf. Thanks dadbintheadmin! I appreciate your comments!! Thre is some great information here. Golf is really a great game, but it can also frustrate you so much. Ben was truly one of the greats. You are so right! Thanks JWean and welcome to Info Barrel. Ben Hogan was amazing and anything you can learn from him is sure to help. Good Article!